Frustrated with dealing hard water in your home? Are you bored of cleaning the toilets relentlessly? To add to these problems, your dishwasher and washing machine might end up breaking down because of blocked water pipes. All of these problems exist because of hard water and you will find many water conditioners that will promise to make you problem-free. Additionally, when you will take the help of a water conditioner, which are based on chemicals and salts, then you will have to think about the maintenance as well. In stark contrast, they don’t eradicate the problems rather they contribute to the cause. As a result, I assume that these problems are utterly painful and tolerating for you, but you can get rid of these troublesome situations if you opt for Clearwave CW-125 Salt Free Electronic Water Conditioner. Just read my review and get to know how this water softener will solve all of your problems. Now, let’s take a peek at the review. 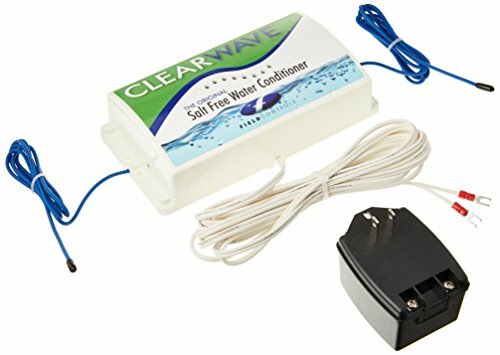 What Is Clearwave CW-125 Salt Free Electronic Water Conditioner? Before going to the depth of the review, you should know what this water softener is. This is a product of the ‘Field Controls’ and it is one of the ground-breaking water conditioner that conditions the hard water with the help of electronic waves technology. No salt or chemicals will be used by this product to condition the hard water and it is not like the conventional hard water systems as well. Therefore, it is a water conditioner that cleans the mess of the water and restores the functionality of water pipes, heaters along with appliances as well. In short, it is a product that will offer you the blend of efficiency and effectiveness. Basically, Clearwave hits the hard water particles with electromagnetic waves and the complete water system of your home will be treated so that it can prevent and reduce the level of hard water problems. Additionally, when calcium and magnesium particles get in contact to each other, they usually form hard scale layers. These hard scale layers cause problems to water heater elements and block the regular flow of waters. However, the Clearwave will defuse these particles by keeping the magnesium alongside the calcium into the suspension and make the water flow normal. Lastly, these particles will be moved down to the drain from the suspension by Clearwave as well. The design of the product is very much compact and it weighs just 2.6 pounds. So, this is light weight in nature compared to other water conditioners. Besides, it has the dimension and measurement of 4x14x12 inches. The Clearwave conditioner needs only 18 volts and 5 watts to run. Moreover, the power cord of the unit is in the middle of six to eight feet. It can be slotted into a small footprint and thus, saving a large amount of floor space of your home. When I bought a Clearwave for my home, I was worried about the installation process, but in reality, I found no hassle while installing the product. All of the directions and wraps are included in the product packet. I just had to hold it next to the water pipe and then use the wraps to attach it to the pipe. So, it was very simple and easy for me given that other conditioners need much more work to install. Afterwards, I had to plug the conditioner to the power source and it was ready to use. I want to address an issue because when I installed it, I had to make sure that the wires are pulled tight around the pipe so that they don’t slip. Additionally, I had to keep around 14 inches of exposed pipe to run it smoothly. The usability of the conditioner is great as I found that it can effectively purge the white build-up from the shower head. On top of it, I have really hard waters in my home and it simultaneously produces hard waters. Nonetheless, when I started to use this product in my home, I was able to get rid of these hard waters. Additionally, after running this system in my home, I noticed that the water was soft and did not include any sticky feeling. All of these works made me believe that this conditioner is a revolutionary one and very effective while eliminating hard waters. The level of performance that I got, from using this product was amazing because it integrates an exceptional technology that can work through a low-capacity transformer that will save energy and gauge for water softening needs. Besides, it requires only five (05) watts or power to operate, which is very low compared to other conditioners usage. Other than this, since it is computerized, I did not need to put any effort to remove the dirt. Additionally, the functional mechanism of the product incorporates 200 electromagnetic low-frequency pulses and the waters will flow via pipes at a great rate as well. On top of this; these electromagnetic pulses increase the ability to heave away mineral salts from the water, so these performances make the Clearwave a unique water conditioner. The exceptional features of Clearwave are as follows. I have put together some benefits that might help you in deciding to buy this conditioner. Here are the benefits of Clearwave. If you use it in your home, you will have no sticky feeling after getting shower. It assists in eradicating the limescale build-up due to hard water. The conditioner is cost-effective and cheap. You will require less soap or shampoo while cleaning the product. After cleaning the water with this system, it keeps the entire natural nutrients. It can enhance the lifespan of heaters or electric appliances such as the pipes, taps in the home and it also increase the life of the water as well. It will not use salts or any chemicals to eliminate the hard water. Hard water strains in the toilet or faucets can be removed by this product. There is money back guarantee and it uses a low-capacity of electricity. Every other product has drawbacks and Clearwave is not beyond it. So, following are the drawbacks of this conditioner. To get the results from this product, you will have to wait for some time after the installation. The ties that are included to hold the wires are not strong enough and some have complained that they had to use ducts or tapes to hold the wires. It is a little bit pricey compared to other alternatives. However, it is legitimated because you will have some unique features and benefits while using it. To conclude the review, I would only say that the amount of drawbacks is minor compared to the features along with the benefits. You will don’t see the technology in other conditioners that is being used by the Clearwave to eliminate hard waters. I pushed myself to buy this conditioner when I was acquainted with the product. So, I will urge you to buy it because if you are dealing with hard water problems, then it fits the bill easily. Therefore, buy it and solve your problems.